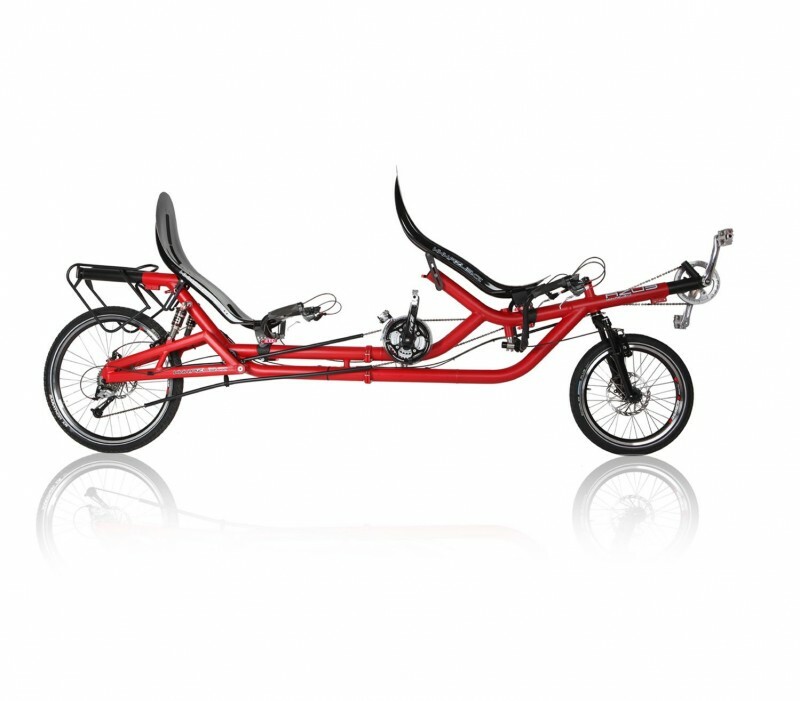 Solid as a rock–the Twin tandem is a blast to tour on with a loved one! 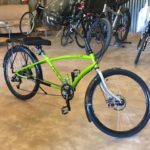 BRC: A folding full suspension capable touring tandem that can accept up to 6 panniers and a top rack duffle, enough gear capacity for a couple to tour comfortably without hauling a trailer. Azub: We made the first AZUB tandem in 2004. The main reason was testing technical solutions under extreme loads. With a fully loaded tandem our marketing manager Honza and his wife Eliška travelled Romania and Ukraine; they also went to Greece and many other countries. 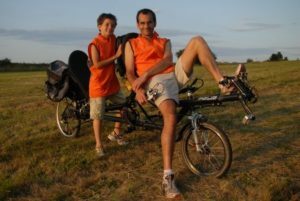 Other testers were Philippe and his ten-year-old son Thomas, who travelled with a tandem bike from the Atlantic Ocean down the Eurovelo 6 path to our town of Uhersky Brod. 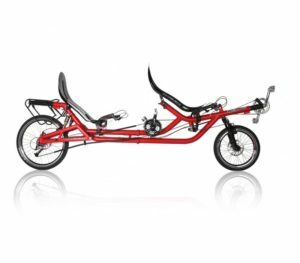 After many years, we returned to the tandem project once again and using all our experience constructed a durable tandem ready to set off both for short trips in neighborhood or around the world. 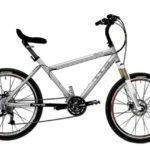 The frame is welded from 60 mm pipes which allows for an overwhelming toughness. Even the rear fork is extremely strong being, which is equipped with a pair of shock absorbers. 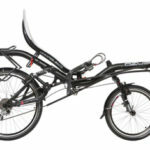 The great advantage of the entire frame is its foldability, or even dismountability if you need to travel for example on planes with the bike. Two folding mechanisms have been developed specifically for tandem bicycles and have been used successfully for many years. Adjusting of the seat is ensured by a newly developed sliding seat bracket which allows precise, fast and easy positioning of the seat. The back rider can comfortably sit up, even if as tall as 185 cm, while in the front seat the height is virtually unlimited. Within the individual manufacture of frame, we are able to intervene into the overall design and create a bike to fit your needs precisely. 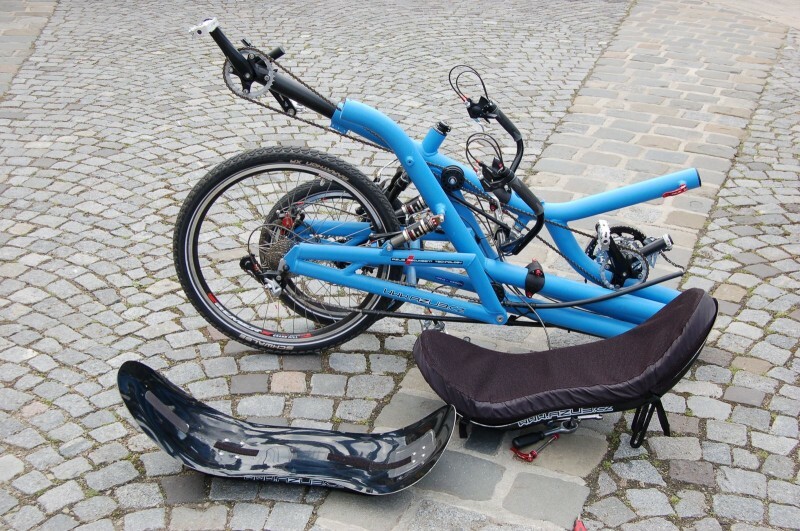 Honza has the most experience with the tandems in our team, and has not only tested our AZUB TWIN, but rode the upright tandem and even was the manager of the Czech National Blind Cycling Team. Read more about his experience and travels on our blog and his personal web page.